Help readers improve reading skills while stimulating their appreciation and increasing their understanding of great literature. Using a "scaffolding" approach, this guide leads readers from simple and engaging reads to more challenging texts, and simultaneously cultivates their interest and skills. 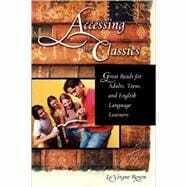 An invaluable resource for middle and high school, ABE and ESL educators, as well as for readers' advisors. La Vergne Rosow is a member of the English faculty and is director of the Teacher Preparation Academy at Los Angeles Valley College in Southern California.